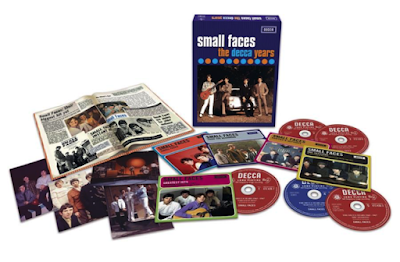 The Definitive Collection of Small Faces’ Early Recordings! A hefty five CDs, 86 tracks in all, compose Universal International Music (Netherlands) late 2015 compilation “The Decca Years 1965-1967” by The Small Faces, far and away the most complete collection of the band’s early recordings. The foursome of guitarist/vocalist Steve Marriott, bassist/vocalist Ronnie Lane, keyboard player Ian MacLagan and drummer Kenney Jones recorded, and wrote, some of the most memorable mod music of the mid to late 1960s, the earliest of which is contained in this absolutely essential box set. Disc One opens with both sides of the eight singles released by the band on Decca, from their 1965 rhythm and blues debut “What‘Cha Gonna Do About It” featuring Marriott’s incredible bluesy vocals to their late 1966 psychedelic gem “My Mind’s Eye” which turned out to be the straw that broke the camel’s back in relations between Small Faces and their label. The 45 was released by manager Don Arden without the band’s approval, the bottom line being the band’s contract was bought out by Rolling Stones manager Andrew Loog Oldham’s Immediate Records and the second half of the Small Faces’ recording career began, although two further singles (“I Can’t Make It” and “Patterns”) were issued jointly by Decca and Immediate as part of the agreement. The Decca singles include four top 10 UK hits: “Sha La La La Lee (#3), “Hey Girl” (#10), “My Mind’s Eye” (#4) and Small Faces’ lone #1 single “All Or Nothing”. The first two are Small Faces at their r and b best, the latter two symbolic of their shift toward a heavier, more psychedelic sound. The disc is completed by five songs originally available only on EPs, a total of 21 tracks, all recorded, released and reissued in mono and sounding crisper and cleaner here than ever before. Disc Two contains the “Small Faces” LP released in May, 1966 which peaked at #3 on the UK charts. The album’s 12 tracks show the band at its raw rhythm and blues best, presented here, as recorded, in mono and sounding wonderful. Six of the album’s twelve tracks were written or co-written by the team of Steve Marriott and Ronnie Lane. There are duplications of tracks as Decca used the same takes and edits for 45s and LPs alike. These include “Shake”, “It’s Too Late”, “E Too D” and “Sha La La La Lee”, as well as “Come On Children” which is presented in a version different from the one found on the band’s French EP . “Sorry She’s Mine”, “Own Up Time” and “You Better Believe It” are the only tracks not included elsewhere on the set. Arguments can be made for and against these duplications, but in the name of musical integrity the album is presented in its entirety and in its original running order. Additionally the quality of songs found on “Small Faces” speaks for itself. 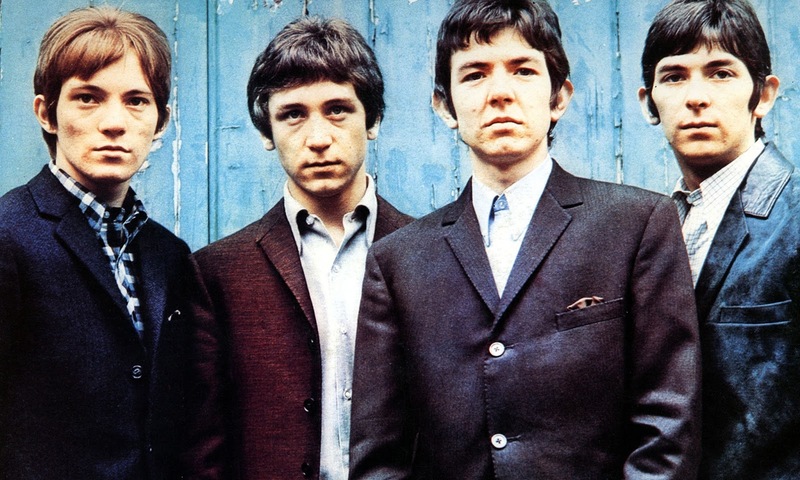 Disc Three contains “From The Beginning” Small Faces’ second and final Decca LP which peaked at #17 on the charts and was released to compete with the band’s Immediate Records debut LP, “Small Faces”. 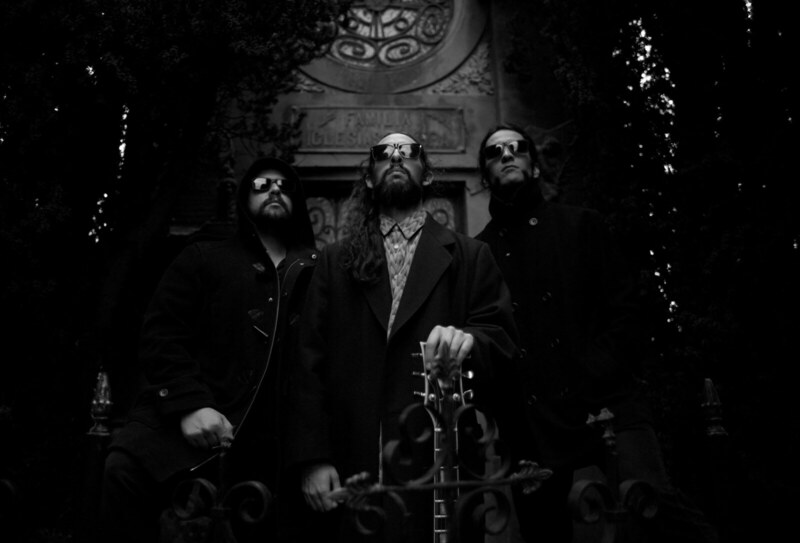 The album showed a band who had grown musically and had moved from a raw rhythm and blues sound to heavier, more psychedelic songs with much more introspective lyrics. Like its predecessor half, seven, of the album’s 14 tracks are band originals. 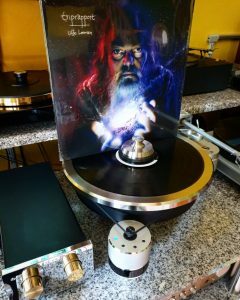 The album contains the band’s two top charting Decca singles, the top 5 hit “My Mind’s Eye” as well as the chart topping “All Or Nothing” and is a harbinger of things to come in the band’s recordings on the Immediate label. Disc Four consists of 23 rarities and outtakes. Alternate versions of early rhythm and blues numbers like “What’Cha Gonna Do About It”, “Shake” and “What’s A Matter Baby” are joined by alternate versions of later, more psychedelic numbers such as “My Mind’s Eye”, “(Tell Me) Have You Ever Seen Me” and ”E Too D”. Alternate mixes on display include “What’s A Matter Baby”, “Runaway” and “That Man”, along with backing tracks of “Talk To You”, “All Our Yesterdays”, “Show Me The Way” and “I Can’t Take It”. One track “Things Are Going To Get Better” is previously unissued and take 14 has been selected for inclusion here. This is the disc which will be of most interest to fans of The Small Faces and 1960s mod rock and it will not disappoint! Disc Five contains 17 tracks recorded for the BBC as well as four interview segments with Steve Marriott. 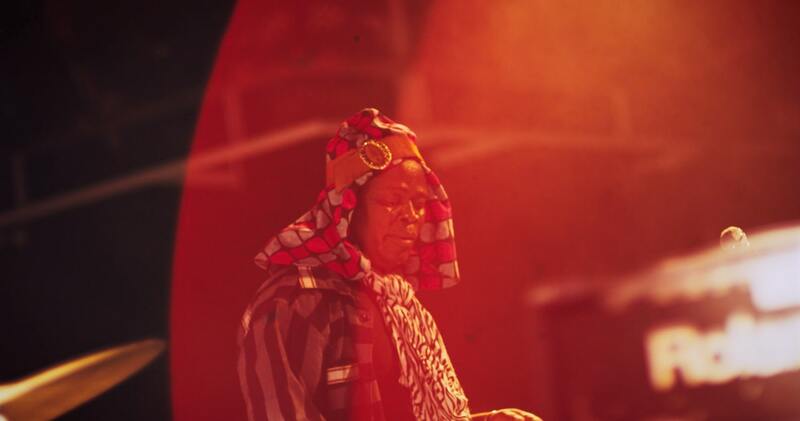 The performances span the band’s entire tenure at Decca, from the very early “What’Cha Gonna Do About It”, “Shake” and “Sha La La La Lee” to the late recordings like “E Too D”, “Understanding” and “All Or Nothing”. 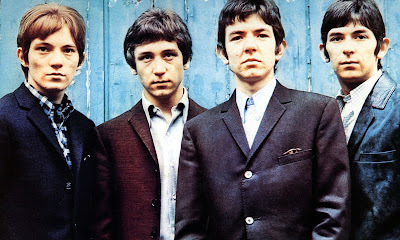 Unlike many bands of the day Small Faces’ BBC song selection was made up almost entirely of tracks recorded as single or album cuts by the band. The sound quality on the BBC Recordings is good, a marked improvement from previously available versions. The five CDs are joined by a 72 page color booklet that includes an essay by Mark Paytress, full track annotations and tons of photographs, press clippings, short bios of each Small Face and in depth track discussions, including lots of quotes from the members of the band, with Ian MacLagan and Kenney Jones acting as supervisory producers. Four postcards round out the package which is available at a pleasantly affordable price. In addition, the remastering job by Nick Robbins at Soundmastering Ltd. is the best ever for The Small Faces’ Decca recordings. “The Decca Years” follows the 2014 release of the four CD box set “Here Come The Nice” which anthologized The Small Faces’ Immediate label recordings 1967-1969. The box sets, both outstanding in their own right stand in sharp contrast of each other with “Here Come The Nice” including a hardbound book, a lyric booklet, and a facsimile acetate among other goodies, housed in an enormous tortoise shell box and weighing kilograms. “The Decca Years” by contrast is a modest package, containing considerably more music but far fewer amenities. The price difference between the two sets reflects the differences. 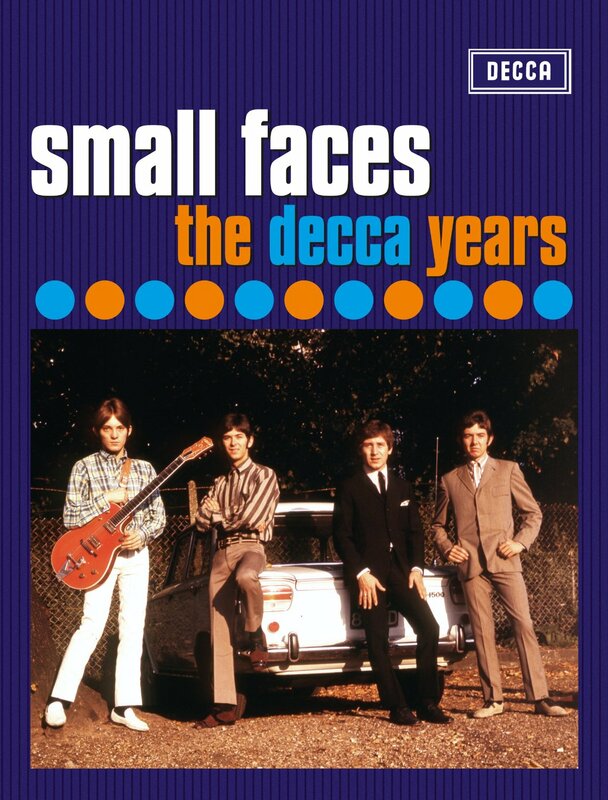 “The Decca Years” actually makes a nice companion to the 1995 Charly Records, Phil Cohen compiled, Small Faces “The Immediate Years” 4 CD, 86 track compilation which I highly recommend and cannot speak highly enough of. Fans of The Small Faces and 1960s mod rock will appreciate the care taken in compiling “The Decca Years”. As was the label’s practice at the time the band was recorded almost exclusively in mono, with a few tracks, very few being released in either electronically processed or true stereo. To his credit project manager Rob Craiger refrained from including any of the electronically processed tunes found on the 2012 Deluxe Editions of “Small Faces” and “From The Beginning”. Thus, the only possible relevant criticism of “The Decca Years” is the inclusion of the same take and edit of tracks issued both as single and album tracks. In my opinion project manager Rob Craiger made the right call, in the name of continuity, presenting the two albums and eight singles as originally released. The short run times of Discs Two and Three are more than compensated by the extremely reasonable cost this set can be obtained for. Bottom line, pick up Small Faces’ “The Decca Years” while it is in print! A great package at an affordable price, what a wonderfully pleasant surprise!